Did you know that each cover of The New Barker dog magazine is an original piece of artwork by a different Florida artist? The summer issue, out this week, features artist Jason Sipple, out of Orlando. He has two distinct styles, and as always, it was a difficult process for us, deciding which piece would grace the cover of The New Barker. The only hint we’ll give you about the subject matter is that Jason lives with two adorable Pugs. In our PlayDogs section, we feature a flyball match in Bradenton, hosted by the Barkaholics Team. The gorgeous photography featured is the work of Kim Longstreet. Then, we’re introduced to lure coursing in Altoona by Paulette Keller. And, thanks to our Jacksonville rover reporter and photographer, we bring you some beautiful photography of the 16th Florida State Canine Frisbee Disc Championships. Who knew dogs could have so much fun “working”? We take a walk through a Masaryktown sunflower maze with a couple of Boxers in our FloriDogs section. We also bring you a fun story from Anna Maria Island about Martha Stewart (we hear she was a real Bulldog). Tina Valant, our South Florida rover reporter and photographer extraordinaire interviewed Dr. Marty Becker, known as America’s Veterinarian. You may have seen him on Good Morning America. 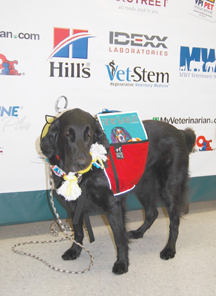 His Big Bus Tour made a stop in Boca Raton and Jacksonville to promote his book, Your Dog: The Owner’s Manual. 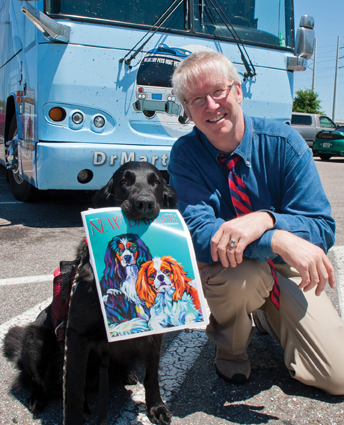 Dr. Marty Becker with traveling companion McKenzie. Photo by Kirk Chamberlain. McKenzie with her favorite dog magazine. Photo by Tina Valant. 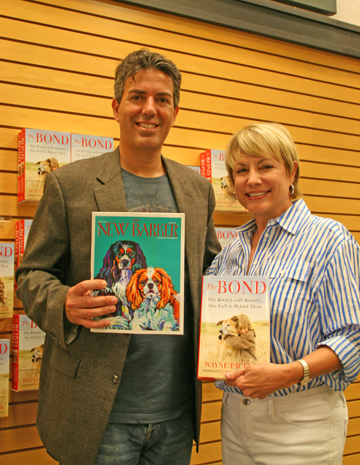 In Sarasota, we caught up with Wayne Pacelle, president of the Humane Society of the United States. He was traveling through Florida to promote his book, The Bond, Our Kinship with Animals, Our Call to Defend Them. Yes, we did talk about Michael Vick. And, while that certainly is not the essence of his book, it was a pretty insightful conversation. Our dog dining section continues to expand and with this issue, we bring back our restaurant review with a twist. Special thanks to Bailey’s family and Danette Morse, whose beautiful photography and sense of humor captured the essence of Dunedin’s The Living Room. Our restaurant advertisers are not only dog friendly, they all serve up some of the best food this state has to offer. Catch the entire list in the summer issue. Or stay tuned to this blog as we list specials and giveaways later this week. Yum. Florida has much to offer in terms of dog friendly destinations and venues. In this issue, we step just outside of Florida with a trip to Tybee Island, Georgia, thanks to Yvonne Guibert of Tampa’s Groovy Cats & Dogs. Then we hit the opposite end of the state with a glamorous visit to Miami. We also visit Mount Dora for some antiqueing, dining, and art. In Tavares, we were treated to Mutts & Martini’s at Al’s Landing. Subscribe to The New Barker dog magazine, Florida’s Top Dog Lifestyle Magazine. If you’d like to contact The New Barker, email anna@thenewbarker.com or call 727.214.7453. Previous Previous post: Xena Helps Rescue A Gulf Island in Florida. Next Next post: Miami. Doggie. Style.